Pioneers in the industry, we offer mobile bio toilet van, bio digestors tank in frp, bio toilet for plain area, bio-toilets digestors and high altitude bio toilets from India. 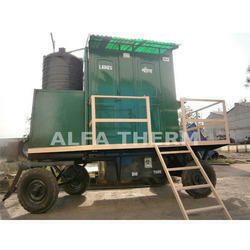 We are delighted to mark ourselves as one of the well-known providers of a broad range of Mobile FRP Bio Toilet. Digests organic solids in a biological way. Prevents human waste and untreated water from contaminating groundwater. Offers an alternative to dumping of wastes into rivers, lakes and fields in rural and semi-rural areas where there is no sewage systems. Effluent (i.e. the water) can be used as fertilizer for soil, to water plants. Does not require any power or consumables to operate. The human waste will enter the tank from the top and the innoculum inside the tank will start treating the waste. On dry weight basis 90%-95% of the solid waste is reduced. The gaseous effluent (bio-gas) is continuously left off to the atmosphere. Liquid effluent is drained from the side to any surface or soak pit (at a distance of 4 to 5 ft from biodigestor tank) without any environmental hazards. It can also be safely used for landscaping and irrigation purpose. A consortium of anaerobic bacteria has been formulated and adopted to work at very low temperature. This is the component which acts as inoculum to the biodigestor and converts the organic waste into methane and carbon dioxide. The anaerobic process inactivates the pathogens responsible for water born diseases. Biodigestor serve as reaction vessel for bio-methane and provides the anaerobic conditions and required temperature for the bacteria. The optimum temperature is maintained by microbial heat, insulation of the reactor (required only in glacier installation) and solar heating. 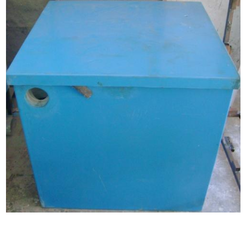 We are providing a wide range of Bio-Toilets Digestors to our clients. With firm commitment to quality, we are manufacturing, supplying, trading and exporting a comprehensive range of High Altitude Bio Toilets. 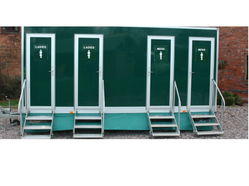 Our offered range of toilets is ideal for usage in high altitude owing to their robust design and non-polluting traits. These toilets are designed by skilled professionals using modern tools and techniques. These are suitable for subzero temperature of Himalayan region as well as glaciers.